No matter what kind of entertainment you’re out for in Nashville, when you want to stop someplace to meet up, fill up, and/or drink up beforehand (or even after), you have an impressive international spectrum of possibilities. There are options to satisfy any craving: good ol’ burgers and brews, Indian, Japanese, Latin — you name it. Finding a meet-up spot before an event at the Bridgestone Arena is a snap thanks to its central location. For fine dining on the Italian side, try Trattoria Il Mulino (144 5th Ave. S), where locally sourced ingredients meet Italian imports, and you can indulge in seafood dishes like the jumbo shrimp francese or keep it simple with one of their tasty pizzas. Nudie’s Honky Tonk (409 Broadway) is an eatery honoring the late Nudie Cohn, whose rhinestone-studded clothing designs defined the look of country music for decades. Tacos, burgers, hot dogs, and some scrumptious Southwestern-style apps are all on offer, and there’s almost always live music happening. You’ve gotta love a joint named after country/folk cult hero Townes Van Zandt’s signature song. Pancho & Lefty’s Cantina (104 5th St.) is the place to go for Mexican munchies like burritos, catfish tacos, and nachos, and ample selections of tequilas and beers will help wash it all down in style. If you’re up for a meal before catching a show at the Ascend Amphitheater, you’ve got everything from fine Japanese cuisine to down ‘n’ dirty barbecue to choose from, so be sure to bring your appetite along. The Green Pheasant (215 1st Ave. S) finds the perfect balance between innovation and tradition, both in its blend of old-school Japanese fare with new ideas and its combination of locally sourced ingredients and items imported all the way from Japan. Everything is delicious, from cold noodle dishes to seafood and poultry. It’s hard to turn down the taste of real-deal Mexican street food. Bakersfield (201 3rd Ave. S) is a good bet. Not only do they serve tacos, tostadas, and more than 100 kinds of tequila, they have salads named after country music legends. Come on, it’s Nashville — what are you gonna do, not eat barbecue? At Martin’s Bar-B-Que Joint (410 4th Ave. S), not only can you load up on lip-smacking brisket and ribs, you also get the opportunity to have fun simply by ordering, what with items like Whole Hog and Redneck Taco on the menu. Looking for a place for drinks and grub before sitting down for a show at Ryman Auditorium? Take a tumble down Broadway and all sorts of options will open up to you. Robert’s Western World (416 Broadway) in virtually as iconic as the Ryman itself. You pretty much owe it to yourself to get a fried bologna sandwich from their Honky Tonk Grill — and you may as well pick up a good pair of boots or a cowboy hat while you’re at it. And they have great live country music around the clock. Any self-respecting fan of country superstar Dierks Bentley should be duty-bound to make at least one pilgrimage to Dierks Bentley’s Whiskey Row (400 Broadway), where the specialty is serving up classic American comfort food like mac & cheese, chicken & waffles, and yes, beer-can rotisserie chicken. Tootsie’s Orchid Lounge (422 Broadway) has been a fixture on Broadway since the ’60s, and a hangout for many country stars in years bygone. Besides being the quintessential Nashville honky-tonk overflowing with drinks and music, the legendary Tootsie’s can also fill your belly with a burger when you need it most. 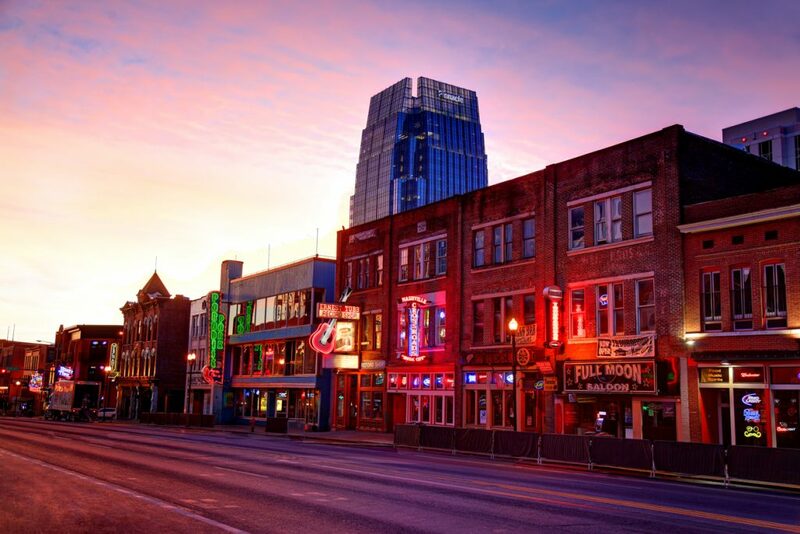 There are few more classic Nashville activities than attending the Grand Ole Opry House, but you may want to fortify yourself with some enticing eats before the show, whether you’re after Tex-Mex, barbecue, or a good old-fashioned steak. The Old Hickory Steakhouse (2800 Opryland Dr.) is located at the Gaylord Opryland Resort, which is worth a visit in itself, and offers a chance for fine dining that includes some especially attractive seafood dishes. Plus, you’ll get to soak up the ambience of a beautiful antebellum mansion. Mission BBQ (161 Opry Mills Dr.) wisely avoids attempting to reinvent the wheel when it comes to barbecue. Instead they keep it classic, ticking off all the right boxes with their brisket, pulled pork, ribs, and chicken, and equally essential sides like green beans & bacon. Want a big burrito? A really big burrito? Step into the Chuy’s outpost (1901 Broadway), where they offer their famous “Big As Yo’ Face” burritos, as tasty as they are sizable. Not quite up for it? You can always try their Elvis Green Chile Fried Chicken instead! Before you enter the Nissan Stadium for a larger-than-life event, make sure to stop someplace first to take care of the small stuff, like finding yourself a good meal. It isn’t too tough a task, since there’s no shortage of awesome choices right within striking distance. Across the river, The Melting Pot (166 2nd Ave. N, Ste. A) offers the opportunity to try something a little bit different, namely a full-on fondue experience. How do four courses of fondue sound to you? If you want you can create your own entrée too, and there are plenty of options for carnivores and vegetarians alike. Also a short hop across the river, the tradition of Demos’ Steak & Spaghetti House (300 Commerce St.) goes all the way back to the 1940s, and the menu is equally classic and reliable. There’s no way you’re walking out hungry after you dig into the chicken fettuccini, baked lasagna, grilled tilapia, or any of their other enticing offerings. Sometimes you just want to tuck into a serious steak, and many have called Jeff Ruby’s Steakhouse (300 4th Ave. N) the best place in Nashville for that particular activity. They’ve got an equally impressive sushi menu as well. There are plenty of possibilities for a pre-show meal on your way to the Exit/In. Sushi, Indian, and American cuisine are only the tip of the iceberg. Mason’s (2100 West End Ave.) at the Loews Vanderbilt Hotel offers you tasty versions of staples like fish ‘n’ chips, burgers, and crispy chicken, but options like lobster pasta and winter squash gnocchi are on offer as well. If you’re feeling a little more like something Japanese is in order, Nama Sushi Bar (2300 Elliston Pl.) is the spot for tuna tartare, every kind of roll you could want, and some excellent vegetarian options. For a taste of India, step into Sitar (116 21st Ave. N) for lamb dishes, seafood specialties, a tidal wave of tandoori, and much more. A show at Basement East is bound to bring a smile, and so are the many awesome eateries in the area. Remember, in Music City you should never say “no” to barbecue, and Edley’s Bar-B-Que (908 Main St.) makes it especially tough to resist, between their pork, catfish, ribs, chicken, and a full complement of tacos to top things off. Everybody in their right mind loves pizza, but it’s got to be good. Not a problem with Five Points Pizza (1012 Woodland St.), where you can either keep it simple or go for more advanced options like their vodka sauce pie or habanero cream sauce pie. Besides just being enormously fun to say, I Dream of Weenie (113 S 11th St.) is ideal if you want something quick and delicious. Dogs and brats with all the trimmings, served from an old VW bus, are tough to beat. Considering the amount of fun you’re in for if you’re headed for a show at the Marathon Music Works, any meet-up spot before or after has got to be equally exciting. Fortunately, there are plenty of possibilities to pick from. An awe-inspiring array of sandwiches is waiting for you at Southern Engine Deli (1200 Clinton St.), where you can pick from classics like the Italian sub, the reuben, and the BLT, or one of their specialty salads. If you feel the call of burgers, the place to go is M.L. Rose Craft Beer & Burgers (431 11th Ave. N). Check out their Five Alarm option — with fresh jalapeños, habanero jack, and hot sauce — or the Angry Dragon, with avocado, egg, and sriracha. If you need to make a short, strategic strike, go Mediterranean with counter service at the Fattoush Café (1716 Charlotte Ave.) and load up on falafel and shawarma, or gyros and baklava. When deciding on a spot for a meal before visiting the Cannery Ballroom or Mercy Lounge, there’s so much available that it’s almost easier to decide what you don’t want and go from there. What you definitely do want if you’re in the market for some Southern-style cooking is Arnold’s Country Kitchen (605 8th Ave. S), where they dish out your classic “meat & 3” meals in an unpretentious, cafeteria-type setting. If you want to find out what pub food in Japan is like, just step into Bar Otaku (505 12th Ave. S) for yakitori (chicken skewers), salmon hand rolls, sake, and more. You haven’t truly experienced pizza until you’ve taken your taste buds to Night Train Pizza (600 9th Ave. S), where there are imaginatively named specialties such as the Pineapple Express pie or the Dixie Chik pizza (no musicians on this dish — just chicken). You might want to go just to uncover the savory secrets of the Greko Express, The Benjamin Britten, and the Casey Jones. Filling your belly before or after a show at the High Watt is no challenge, with great options that can take you down an Asian path, put you in a Puerto Rican state of mind, or keep you in an all-American mood (among others). Whether you’re after burgers, brick-oven pizza, “two-handed” sandwiches, or some mac and cheese, you can find classic comfort food with a sophisticated slant at The Stillery (113 2nd Ave. N). Ramen may not be the first thing that comes to people’s minds when they consider Nashville cuisine, but Otaku Ramen (1104 Division St.) just might change that with their broad array of ramen-based dishes and Japanese snacks like seaweed salad and chicken gyoza (pan-fried dumplings). You can take a trip to Puerto Rico without leaving Music City by stopping in at Salsa (818 Palmer Pl.) for arroz con pollo, carne frita, or specialty items like the Mofongo Relleno.